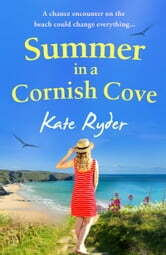 Set against a gloriously rugged Cornish backdrop, two lives are about to be changed for ever... The book to fall in love with this summer - perfect for fans of Fern Britton, Liz Fenwick and Veronica Henry. Oliver Foxley is an acclaimed movie star and global heartthrob. But under the glare of the spotlight his 'perfect' life - and marriage - is slowly starting to crumble. Cara Penhaligon is a struggling young Cornish artist, and widowed mother of two children. Life has been unbearably harsh to Cara, but meeting Oliver might just give her a second chance at the happiness she deserves. As each begins to heal the other, the pieces of Oliver's frustrating jigsaw puzzle effortlessly fall into place. But as the Cornish summer draws to a close, Oliver faces the toughest of choices, and no one emerges quite as they were at the start. Previously published as Cry of the Gulls. This book really grabbed me. The characters were real. I felt like I was Oliver, thinking his thoughts, feelings his feelings and living his life along with him. I love Cornwall and her descriptions brought it to life. The plot was complex and exciting. I gave it 5 out of 5 - perfect romance book for women.